Sajid Nadiadwala's film Heer and Ranjha has not yet started. Shahid Kapoor to walk the film gave the dates he would freak. Romeo Juliet movie is being made in New York whose budget is 55 million. That's why Sajid not want to take any chances and Ranjha and Heer's story, he thought back to work. Sajid the director Sabir Khan to discuss the issue and he did order that they work on the story again. Heer and Ranjha to Sajid liked the basic story idea, but they were not satisfied with the story. He said Sabir, even if they work on the script again for it to adjust Shahid Why have the dates.Sajid also have to accept this and they say second half of the movie was not good. I Sabir said that they work on it. For this time I have them by 30th April. I told Sabir and they agreed. Currently looking for female lead is released. First reports were that the film will be Fakree Nargis but they did not in this film is going. 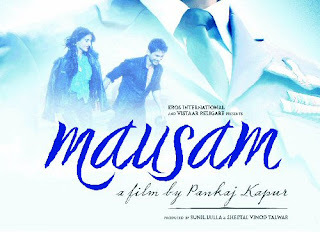 Pankaj Kapoor's dream project Mausam just got costlier. The fastidious director has decided to shoot an elaborate promotional number which would cost the producers a staggering amount of money. The song which began shooting at suburban hotel on Saturday evening is not quite the promotional video that Shahid has done in the past with Kareena Kapoor for Jab We Met...remember 'Mauja Hi Mauja'? Pankaj insisted that Shahid and Sonam not just take a chance with a dance .The specification to choreographer Ahmed Khan is, the lead pair has to remain in character even when dancing for promotion, thereby taking away from the characteristic zing of a promotional video. A fairly expensive exercize for a film that's already gone over-budget. But as producer Sheetal Talwar puts it, "No expense is too much for this film. Every penny is a wise investment. The song has cost a whopping amount. But the extra amount is money well spent. Did anyone ask K. Asif how much he spent on that 'Pyar Kiya To Darna Kya' song in Mughal-E-Azam? What is important is not the cost. It's the end-result. We've shot a song that Shahid and Sonam can proudly show to their children." The extra song which would serve as a promotional video for Mausam, choreographed by Shahid Kapoor's buddy Ahmed Khan, would cost the producers a whopping extra 1.5 crore rupees. The song for which an elaborate set has been constructed began shooting at the Royal Palms in Goregaon on Saturday night. It is unlike any promotional number. Says Ahmed, who is a very close friend of Shahid, "Yes, we've decided to shoot an additional song for Mausam. It is the film's promotional video. But when it comes to Pankaj uncle nothing is predictable. So this is a promotional video with a difference." Ahmed explains the difference. "I've shot so many promotional video. They are all out of the film's context with just the lead pair dancing to get eyeballs. Pankaj-ji insisted our video be within the context and characterization of Mausam and that Shahid and Sonam will dance and conduct themselves in the video as characters from the film, and not two stars dancing. He also insisted on the others actors like Anupam Kher being present in the number." For Ahmed, it is a challenge doing the song, "When Pankaj uncle plays even a cameo role he goes into so much detail. You can imagine how nuanced he gets shooting his first film as director. I've never done a number like this where the promotional video is part of the film's narrative. I was just not allowed to let go of the characters that Shahid and Sonam play in Mausam while making them dance." Shahid Kapoor Priyanka Chopra trying to work it out? Shahid-Priyanka trying to work it out? Shutting the mouth of all gossip mongers, actress Priyanka Chopra and actor Shahid Kapoor get chatty with each other at Shahrukh Khan Holi party. This was the first time that the duo were seen together after their reported breakup recently. However, things looked quiet comfortable between the two, both of them chatted with each other as if there was nothing wrong between the two. Reportedly, both of them came separately, but hanged out together in the party. The last time the couple were seen together was in Karan Johar's My Name Is Khan celebration bash, however, reportedly Shahid and Priyanka were dating each other at that time. If the duo are on talking terms then looks like Kunal Kohli's untitled film starring them will definitely see the day light. Priyanka refuses to talk about Shahid's relationship! Priyanka Chopra has refused to talk about her alleged relationship with Shahid Kapoor. The actress feels that even if she clarifies now, people will come up with one after the other. According to Priyanka Chopra, it makes no sense to answer each and every rumour, which revolves round her. The actress has said that she has never opened up about her personal life and she wants to maintain the same all through the life. Recently, there were reports that the actress and Shahid Kappor had a differences over the latter's birthday guest list. It is reported that the actress wanted him to remove Kareena Kappor and Vidya Balan's name from the invitees list. But Shahid refused to bow down to her demands, as a result, Priyanka went to the US to spend her weekends, claimed reports. We had no ideas this foursome were all pal-y pal-y! According to our source (who was tipped off by a restaurant patron) Shahid Kapoor,Ranbir Kapoor, Ranveer Singh and Anushka Sharma had a quite dinner at Olive in Mumbai last night. They all left together after about a few hours and headed out in Ranbir’s ride with RS & AS in the backseat together (obvi). Unforch we have no piccie of the foursome (boo) because the restaurant owner was quite pissy about photogs on his “premise” (it was actually the roadside) and thus sent two security guys who basically mandhandled the paps and wouldn’t let them snap anything. Oyy veeeys, we would’ve loved to see these 3 guys & a girl together! We shake our fist at the owner for this missed photog opportunity!!!" Sandip Dhar and Shahid Kapoor are quite get things. His career graph something - anything looks like Shahid. Sandip Ghosh on the screen to bring Ken and Ken the launch of Shahid had his film Ishq Vishk. Sandip was the smallest Coampatishne then won a TV dance judge had it even Ken. Sandip then join the Academy were all dancing to Adawara sedative like Shahid. Sooraj Barjatya's films have both. The last thing that they both have a C in that they both are vegan. Shahid says a lot about Telentad Sandip and I want to do movies with them. संदीपा धर और शाहिद कपूर में काफी बातें मिलती हैं। उनका करियर ग्राफ कुछ-कुछ शाहिद जैसा ही लगता है। संदीपा को स्क्रीन पर लाने वाले केन घोष हैं और केन ने ही शाहिद को अपनी फिल्म इश्क विश्क से लांच किया था। संदीपा जब छोटी थीं तब एक टीवी डांस कॉम्पटीशन जीता था इसे भी केन ने जज किया था। इसके बाद संदीपा ने शामक दावर की डांसिंग एकेडमी जॉइन की थी बिलकुल शाहिद की तरह। दोनों ही सूरज बड़जात्या की फिल्में भी कर चुके हैं। आखिरी चीज जो इन दोनों में एक सी है वो ये कि दोनों ही शुद्ध शाकाहारी हैं। संदीपा इस बारे में कहती हैं शाहिद बहुत टेलेंटेड हैं और मैं उनके साथ फिल्म करना चाहती हूं. While, the entire media including friends are speculating about Shahid Kapoor and Priyanka Chopra's break up as the actress was not even spotted at his birthday bash, the actress made sure that Shahid gets his birthday gift exactly at the stroke of midnight. Well yes, Priyanka Chopra, who could not be present for her 'only friend' Shahid's birthday, made sure that she plans out a surprise birthday gift for him. She had booked for a special gift delivered to him, exactly at the stroke of midnight. Priyanka had selected one white helmet from a Diesel store in Juhu and informed them that she won't be available, but one of her staff will pick up the parcel from the store. The helmet was gift-wrapped exactly the way Priyanka had instructed. Shahid, who owns a Harley Davidson Bike and is passionate about bikes and related accessories, was excited to get his surprise gift. Looks like it a perfect Birthday for Shahid Kapoor, though he must have definitely missed Priyanka Chopra at his birthday party. DESCRIPTION: Shahid Kapoor celebrated his 30th birthday with contest winners of Bollywood Hungama on February 25,2011. We bring you some tantalising moments from this Exclusive event. Must watch!